When playing word association with Star Trek, the first thing to come to mind with regards to augmented reality is likely Holodeck, not The Game, an obscure episode from season five of Star Trek: The Next Generation. In this episode (spoiler alert), an addictive augmented reality game devised by the Ktari alien race brainwashes the crew of the Enterprise. The players advance in the game by guiding disks into cones by relaxing their minds. 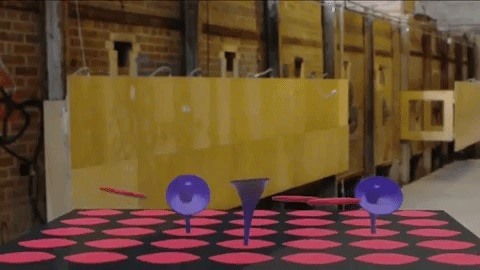 To simulate the game, a team of developers created a HoloLens version using Unity that the player controls by moderating their stress level. The Game monitors stress levels through a Pip biosensor, a $179 Bluetooth device that gauges stress by measuring how well the skin conducts electricity (called the galvanic response) and translating it into a computer input. For those who do not have a Pip, the game also works with voice input, with "relax" and "stress" acting as the word commands. I have to admit I'm not a huge fan of Star Trek, so I had to watch this episode for some context on this game. Aside from a guest appearance from Ashley Judd, the episode is notable in its foretelling our modern addiction to smartphones. In fact, in Star Trek, The Game is found to trigger a neurological response in the pleasure center of the brain in much the same way that casual mobile games do. 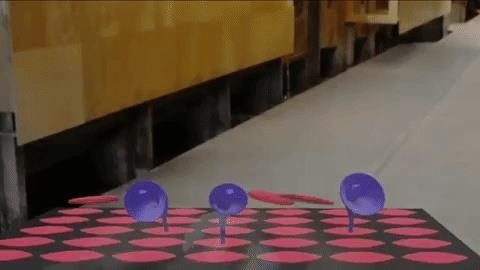 Are we doomed to succumb to the same weaknesses with AR games? One of the coolest things about this demo is the addition of a new way to engage in augmented reality. Augmented reality demands a more natural approach to user input. With HoloLens, hand gestures and voice commands are the norm now, but sometimes feel stilted in an AR universe. A brain control interface, like the technology from Neurable, could be the next step in a natural interface, so the simplified version based on stress in The Game is a fascinating intermediary step. "We talked about adding a BCI interface, and I'm confident it's possible," Robert Burke, leader of this project, said in an interview with Next Reality. "I'm familiar with some stress metrics that can be obtained from noninvasive EEG, but to the best of my knowledge the galvanic approach [used in the project] is more accurate." Burke, along with team members for this Star Trek project, previously worked on BCI projects with MIT Media Lab Europe about ten years ago. He noted that BCI hardware has come along way and admitted that he is interested in exploring BCI partnerships for this project. However, he remained coy regarding whether the project may be commercially available. "For Microsoft Store, stay tuned. This is a passion project that took on a life of its own," said Burke.